Pastors Conference afternoon session hears from John Croyle, Danny Lanier, Herb Reavis Jr.
Danny Lanier, pastor of Northcrest Baptist Church, Meridian, Miss. In the afternoon session of the Alabama Baptist Pastors Conference, John Croyle, founder and executive director of Big Oak Ranch shared the message “The Pastor and His Family.” He said God called pastors to “have a ripple effect.” “We were ordered by our Boss for there to be a ripple effect. The way we carry that out is by being a pastor. … God called you and me to go out front. He never called us to lead the troops by going back to the tent. You and I were chosen by God Almighty to do what we do. You’re an envoy. You’re an ambassador for your Boss. You carry on His agenda, not yours.” Croyle shared from Matthew 23, noting “God never called you to sacrifice your family for the sake of your ministry. He doesn’t want another building. He wants a changed life. 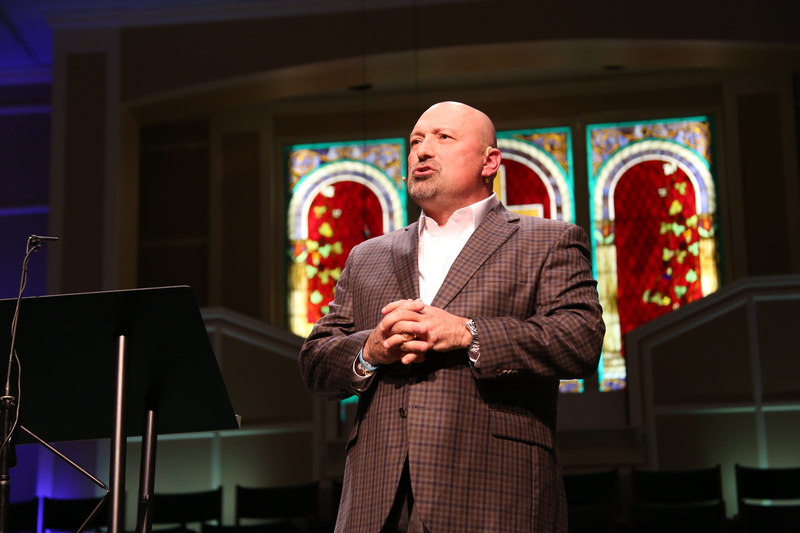 … You’re obligated to one thing — the King.” Danny Lanier, pastor of Northcrest Baptist Church, Meridian, Miss., shared about “The Pastor and His Calling” and shared from Isaiah 49:1–2. “If God’s called you as a pastor you are an arrow in the hand of God,” Lanier said. “It’s amazing what God can do with nothing. He selects His arrows and He saves us … and then He begins to shape us. When God calls you and begins to make you usable in His service, there’s going to be some shaping in the process. Some sanding of the arrow. … You’ll never be used by the Archer if you’re not where God put you.” Herb Reavis Jr., pastor of North Jacksonville Baptist Church, Jacksonville, Fla., shared about “The Pastor and His Preaching,” pulling from 1 Kings 18 and said “if we want a Holy Ghost revival in the Church then we need to see a Holy Ghost revival in the pulpit. … Preaching is a holy God burning in the bones of a man delivering His message through human personality. It is still soul-stirring. … You can’t make everyone happy if you preach the Word of God, it’s not about giving people what they want to hear it’s about giving people what they need to hear.” Reavis said we need revival preaching which “expects a definite decision, exalts God’s majesty and grandeur and exposes the powerlessness of false gods.” Be sure to come back for this evening’s session at 6:30. This entry was posted in Home and tagged Alabama Baptist Pastors Conference, Big Oak Ranch, Danny Lanier, Herb Reavis Jr., John Croyle. Bookmark the permalink. 1 Response to Pastors Conference afternoon session hears from John Croyle, Danny Lanier, Herb Reavis Jr.
A very profound set of marching orders!! WELL DONE! !